This was the little mystery from my last post. A silk and bead necklace for Jane. 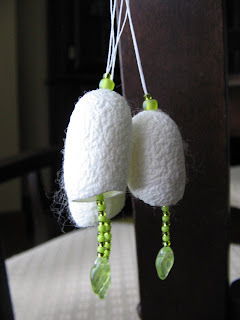 I thought the silk cocoons looked like eggshells, perfect for Easter. 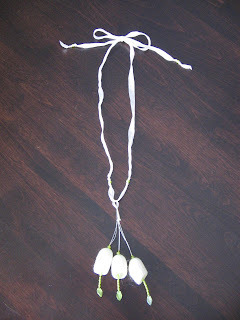 Jane thought that, finished with the green beads, they looked like snowdrops. I can absolutely see that when I look at it now. I made a ultra-simple tie closure for the back, that way she can wear it as a choker or a pendant.